"Once the preservation of natural landscapes is seen as the local economic base rather than only an ethical or aesthetic act, the polemics of extraction versus environment should change." This book argues that empirical analysis conclusively shows that protection of landscapes portends greater economic vigor than economies that sacrifice environmental quality for extraction-based resources. According to the author, “If we could lay to rest the fear that environmental protection will cause the imminent economic collapse of communities, the acrimony would subside and it would be much easier to engage in civil discourse over the real choices communities face.” This book distinguishes the role played by extractive industries in local communities in contrast to the role of natural landscapes. I had known about Professor Power for decades, however this volume was my first attempt at delving deeply into his thought. One reason is that a Birthplace of Rivers National Monument is proposed for my local area, and with that proposal has come local controversy. Second, Christians For The Mountains advocates for clean environment in the teeth of polluting coal and gas extractive industries in Appalachia. Our premise is that God’s creation will supply human needs without a corresponding requirement to abuse the earth. While Dr. Power’s book has no direct theological teaching, implications correspond. Power demonstrates that healthy, clean, attractive, unsullied environments lay the framework for a vigorous rural economy, while the converse of polluted, degraded landscapes trends toward “boom” economic flush to subsequent “bust” community decay. 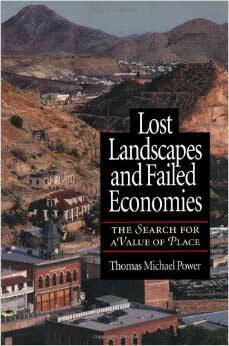 That Lost Landscapes and Failed Economies was published in 1996 almost deterred me from purchasing the volume. After all, a lot of water has flowed under the bridge, so to speak, in the intermitting several decades. While economics might have time-honored principles, modern context can and does change rapidly. Yet while many of Power’s anecdotes, data, graphs, and tables are antiquated, his thesis is solid and timely. To my knowledge the book is not in digital format. I feel this work is so important that I have purchased several used books for a few bucks each to pass around. Extraction-based economies are export oriented. That is, the money generated comes from selling raw materials to a processor outside the area. A key to rural economic vitality is retaining money that circulates as a multiplier within a local economy. The adage, “Buy locally,” applies. Yet extractive-based mono-economies typically have excessive leakage. That is, much of the money earned by miners, farmers, and mill workers is spent outside the local communities importing goods and services. For one thing, extraction-based communities tend to have wide up-and-down swings that discourage local business investment seeking stability. For example, a rural car dealer might do well during a boom cycle, but have few sales during a bust cycle. Less local multiplier money means fewer businesses and related jobs. Shoppers simply drive an hour or two to cities for their shopping. The small timber, mining, or farming community stores are bereft. According to Dr. Power, “Leakage from the local economy to finance outside goods and services limits the [positive] impact of export earnings. Local economic activities that slow or stop leakage generate jobs and income.” Along this line, Power goes on to say about extractive economies that “more of the same” does nothing to develop the economy, but continues dependence and instability. Power goes into extensive detail on the negative economic implications for rural communities heavily involved in mono-economies of export-oriented mining, timber, agriculture, and tourism. However, any or all of these within an otherwise mixed healthy economy can contribute moderately yet positively if the ecosystem and attractiveness of the landscape is carefully protected. Power contends that the value of protected scenic, biodiverse, vibrant landscapes is in the people attracted to settle nearby. Such people are willing to forgo higher wages and other amenities found elsewhere for the recreational and aesthetic values found in pristine places. Some of these people, such as retired folks, bring their fixed incomes that mingle into the local economy. Others are social and business entrepreneurs whose talents spur the economy. Some businesses, too, are attracted to these landscapes as wage costs can be lower due to employee trade-offs for desirable living places and overall improved quality of life. Since attractive, intact ecosystems are in short supply especially in the East, such rural communities that indeed still have these unscathed natural landscapes nearby will find their best economic future in protecting these special places. Such scarce special places will draw nature-loving people to settle in those communities, to roll up their sleeves to figure out how to make a decent livelihood, and integrate their lives into their communities. Appalachian communities with extractive mono-economies are typically impoverished and land/water degraded, with much of their talented young people moving away. Refurbishing and protecting landscapes and their ecosystems will do much to reverse this trend.